Both the RPS and RES require that the percentage from renewable energy resources must come from new projects that achieved commercial operations after 1997. The Massachusetts RPS calls these resources “Class 1” while the Rhode Island RES simply calls them “New”. These are the resources that most of us think of as renewable – wind, solar, small-scale hydro, and anaerobic digestion. Below, you can see the different technologies that qualify, as well as the distribution per technology in each state as reported in their most recently available compliance report. On the left: Distribution of generation types used to fulfill the RPS in 2015. Retrieved from Massachusetts RPS & APS Annual Compliance Report for 2015. On the right: Distribution of New RECs used to fulfill the RES in 2016. Retrieved from Rhode Island Annual RES Compliance Report for Compliance Year 2016. 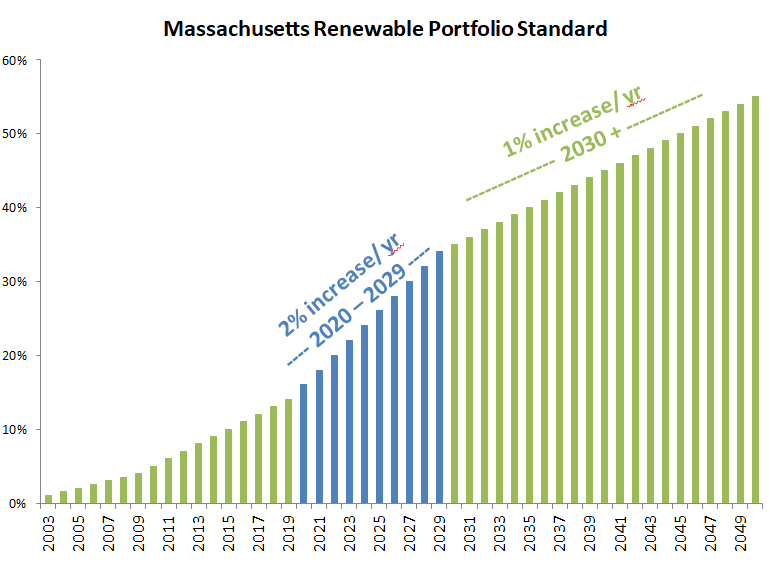 The Renewable Portfolio Standard was adopted by Massachusetts in 2003. Seeing its initial benefits, the Mass legislature passed the Green Communities Act in 2008 which increased the RPS by 1% every year indefinitely. In 2018 that percentage is 13%. In 2018, the legislature changed it to a 2% per year increase from 2020 through 2029. 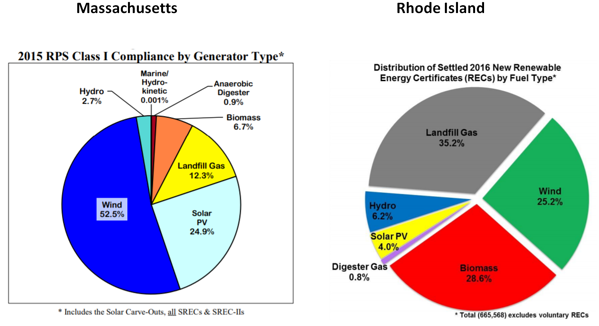 Rhode Island adopted the Renewable Energy Standard in 2004. In June 2016 the Rhode Island legislature extended the RES at a 1.5% increase every year through the end of 2035. From 2035 on, retail electricity suppliers are required to keep providing 38.5% of their load (the final target) from renewables in perpetuity unless there is a change in policy. Both states have created special incentive programs to boost their in-state solar industry. In Massachusetts, that first came in the form of the RPS Solar Carve-Out (SREC) Program. Under this program, PV projects built from 2010 through April 2014 were categorized as SREC-I and from May 2014 through November 2018 as SREC-II. Both SREC-I and SREC-II got higher incentives than regular Class I resources making solar in Mass very profitable. Massachusetts is now moving away from the SREC program and it’s kicking off its new Solar Massachusetts Renewable Target (SMART) program later this month. SMART decreases the incentive that solar receives over time in order to bring solar to the same level as other Class I resources. 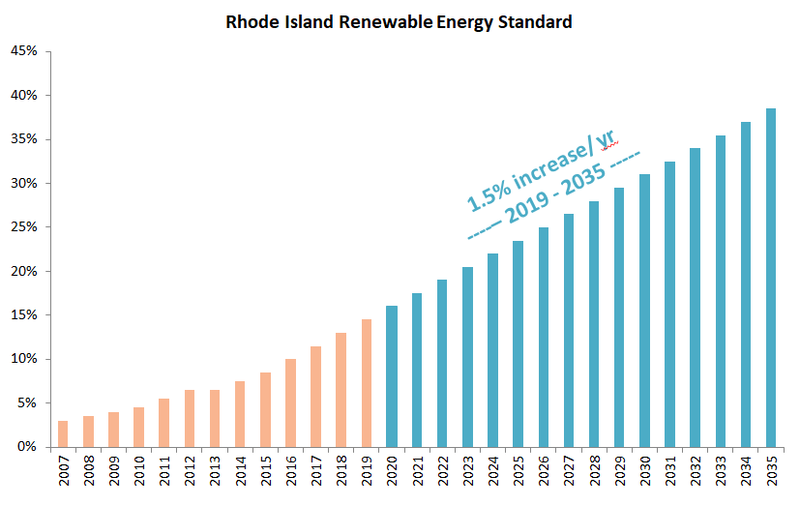 Rhode Island took a different approach when it decided to create the Renewable Energy Growth program. This program, which targets all renewables not just solar, requires National Grid to offer to long-term contracts with projects and offers a performance-based incentive. 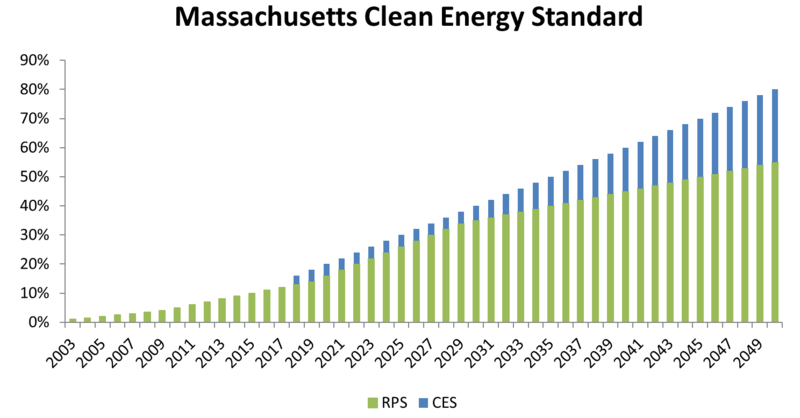 As if matters weren’t complicated enough, beginning in 2018 Massachusetts also introduced its Clean Energy Standard (CES). The CES is a regulation created in response the Supreme Judicial Court ruling in Kain v. DEP - the lawsuit to which Green Energy consumers was party. It started at 16% of retail load in 2018 and it increases by 2% every year until reaching 80% in 2050. The Clean Energy Standard is not part of the Renewable Portfolio Standard. It actually sits on top of the RPS demanding more renewable energy as seen below. The CES requires that more electricity come from new renewables, including large hydroelectricity from Canada (whereas the basic RPS excludes large hydro). Where do RECs come into play? When renewable energy is generated two things happen: the green electrons get delivered to the grid and a Renewable Energy Certificate (REC) is created. One Megawatt hour (1,000 kWhs) generates one Renewable Energy Certificate. Electricity and RECs can be bought, consumed and sold separately. Utilities and retail electricity suppliers demonstrate to the Massachusetts Department of Energy Resources and Rhode Island’s Public Utilities Commission that they have fulfilled the requirements of the RPS/ RES by providing RECs based on the percentage requirement for that year. If for some reason a utility or competitive supplier cannot meet its obligation it must pay an Alternative Compliance Payment (ACP) for each megawatt hour that it does not have a REC for. We will be posting another blog post in the near future on the importance of REC tracking and their ability to green our New England grid. Stay tuned! Why are the RPS and RES important? 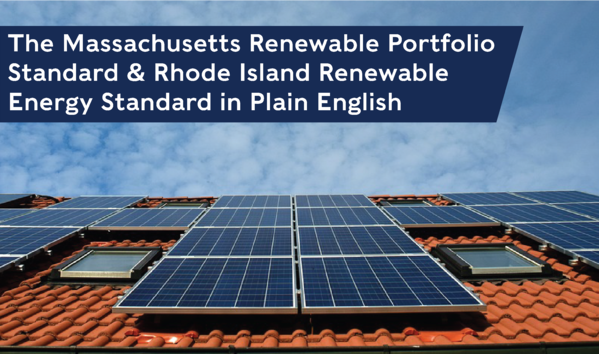 Both the Renewable Portfolio Standard and the Renewable Energy Standard have been the main forces behind renewable energy development in Massachusetts, Rhode Island and the rest of New England. They show our commitment to renewable energy by creating competitive markets that benefit ratepayers. Renewable energy helps us break our dependency on fossil fuels. It also helps bolster our economy by creating local and meaningful jobs. But most importantly, the RPS and RES have enabled both states to lower greenhouse gas emissions from the electricity sector, helping the region combat climate change.